If someone can add zombies to Minesweeper (and do it well) then who am I to stop someone else from making a dice game out of firefighting? It has been done, and it's good. There is surely a message being sent through the Android and iOS game Fire and Dice: A message about the randomness of spreading flame, perhaps. Or maybe a hard truth that you would be lucky to be rescued from a burning building. But this is not really a message game. It is a strategy game complicated by lucky and unlucky dice rolls, a mix of intention and happenstance that makes games like Angry Birds and Peggle so much fun, too. Your playing field is several city blocks. Fires will erupt on them and people trapped in their homes will plea for help. To save them, you will first roll some dice. Each die is painted not with numbers but with icons that display gas for the fire truck, water to douse flames, ladders to rescue people or more fire engines to multiply your deployments. Whatever icons you roll are the resources you can use to fight fires in your next turn. Each gas can, for example, enables you to move one city block. If the fire is two blocks away, you will hopefully roll at least two gas cans. You can keep re-rolling before committing to your turn, but you must lock in at least one die per roll. Once you gather your resources, you spend them on moving your fire engines through the city, dousing a fire one water icon at a time, saving one person with any two ladder resources. The game keeps on going until you are essentially burned out. New fires flare. Unattended ones swell. 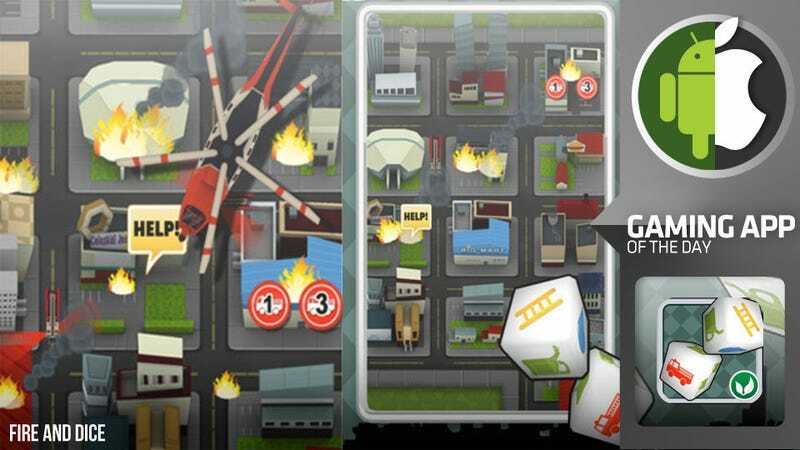 Skilled management of this blazing town will earn you points and power-ups. Your ability to plan is entangled with the chance that you're lucky. he dice rolls randomize your chances to succeed. But your ability to choose how to deploy your fire engines gives you strategic control. To describe Fire and Dice as a game of, well, putting out fires with dice, makes it sound strange. But the systems and style of play work well. It all makes a lot of sense when you play and feels fresh and right for a phone game. It controls well with just a touch screen, taxing your brain and reflexes. This is an odd idea well executed. It's worth your time.